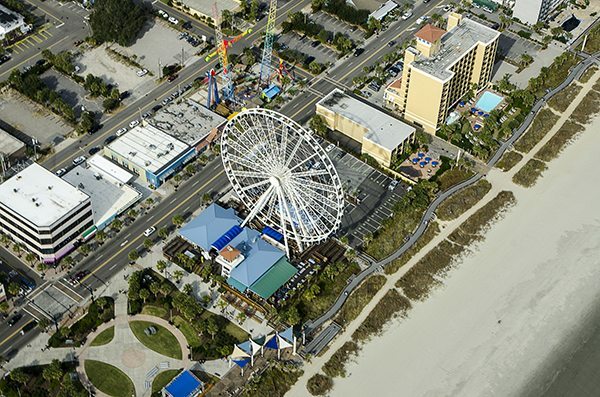 Take a stroll on the Myrtle Beach Boardwalk, encompassing over a mile of coastline and featuring a multitude of family friendly attractions, local shops and delicious dining options to enjoy. 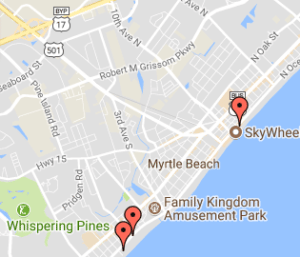 Attractions near the Boardwalk include the Myrtle Beach Skywheel, Second Avenue Pier, Ripley’s Believe It or Not Museum and 4D Moving Theater, and many classic arcades. If you’re looking for dining options, look no further than beach-front favorites like ART Burger Sushi Bar, Bandito’s Cantina, Peaches Corner and Pier House Restaurant. There’s also an abundance of year-round events and festivals held around the popular destination, including the summer-long “Hot Summer Nights” series, featuring a weekly kid’s carnival, games, live entertainment and much more. Other events include the Carolina Country Music Festival, the Sun Fun Festival, the annual St. Patrick’s Day Festival and the annual Oktoberfest celebration.